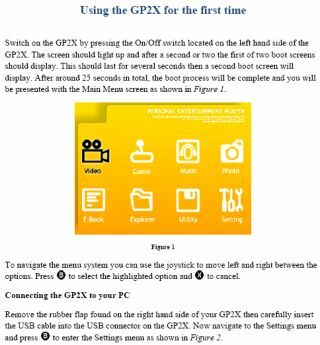 This is the unofficial user guide for the GP2X. At over 40 pages, the guide contains everything from setting up your GP2X, installing and using software, listening to Music, watching Videos, reading E-Books, firmware flashing and an introduction to developing on the GP2X. - rewrote firmware update guide. it now has two seperate sections, updating to v2.0.0 and updating to v2.1.0 as they are slightly different. - added new sections for the GP2X Menu Skins and Breakout Board. - updated development introduction with a new setup I created, should make things easier and also using the very latest SDL libs. I tried to extract but got error message. Maybe I'm not supposed to extract? UNRAR 3.4.3 from www.rarlab.com for Linux extract this file without any problem. and acroread for Linux read it perfectly. I LIKE CAPITAL LETTERS. Err. I mean- Nice work ;) Thanks! A version that can be *easily* read on the gp2x itself would be interesting. Maybe as a stand-alone-reader-app like edgepad. im planning to do a plain text version and a html version sometime soon. Nice one! Pretty comprehensive to boot! Fantastic. Thanks for putting in the effort, this has been really useful. It might be a good idea to add an chapter about connecting the gp2x sd card to Linux. How to format it (does it require vfat or is ext2/3 also ok) etc. etc. P.S. The zip file works just fine in Linux. No problem extracting with ark whatsoever. Is there an HTML of this yet, or something that won't crash Adobe? great, helped me get started with TONS of basics, but I would love something that goes into detail instelling types of programs. dont have an f200 but the guide made me order one. Flippin sweeeet!! !